Hey everyone! It's been a while since I last did a monthly favourites post. In fact, the last one was all the way back in October! But I decided that it was time to bring it back, especially as I'm home from university for Easter and it's a lot easier to take the photos at home! (AKA my dad takes the photos for me haha). My March favourites feature quite a few nail polishes, including the Speedy Quick Dry Collection* from Barry M, and I'll Make It Fit* from the Gelish Cinderella Trends collection. I've also got Easy Nails Fast and Fruity Nail Polish Remover, and Barry M's Orion Gelly Hi Shine Lipgloss. * Last but not least I have this gorgeous Classic Sheffield Lady* watch from Daniel Wellington, which is my new favourite accessory. Click below to find out why these were my favourites this month. First up is the Barry M - Speedy Quick Dry Collection. * I couldn't pick just one of these, and I think they work so well together as a collection that I wanted to show them all. You'll have seen quite a lot of these in my nail art recently, I'll be doing a full review once my dissertation is over but believe me when I say that they really are quick dry! I also love the colours, as you all know I'm a big fan of pastels so this is basically the perfect collection for me! These are all available now for £3.99 each here. Next up is more Barry M. This time in the form of Gelly Hi Shine Lips, in the shade Orion*. Before this I'd never tried any of the Gelly Hi Shines so I was really impressed. I'm not a big fan of lipgloss because of how sticky it is but this isn't sticky enough to be annoying, and it's also the perfect shade for my very pale face. I've been wearing this nearly every day, which is why I haven't shown it with the lid off as it's completely battered now. You can buy this here for £4.99. I didn't want to put two whole collections in my favourites, otherwise I would have put the whole Gelish Cinderella Collection* in here. I love all of them, and again a full review will be coming in the next few weeks, but I especially love this one from the Trends trio of the collection. This is 'I'll Make It Fit'* and it's a gorgeous multi-coloured glitter that can be worn on its own or over another colour. You can buy this here on Amazon for £16.95. This is an old favourite of mine, I mentioned it on Instagram a couple of years ago and I still worship it. 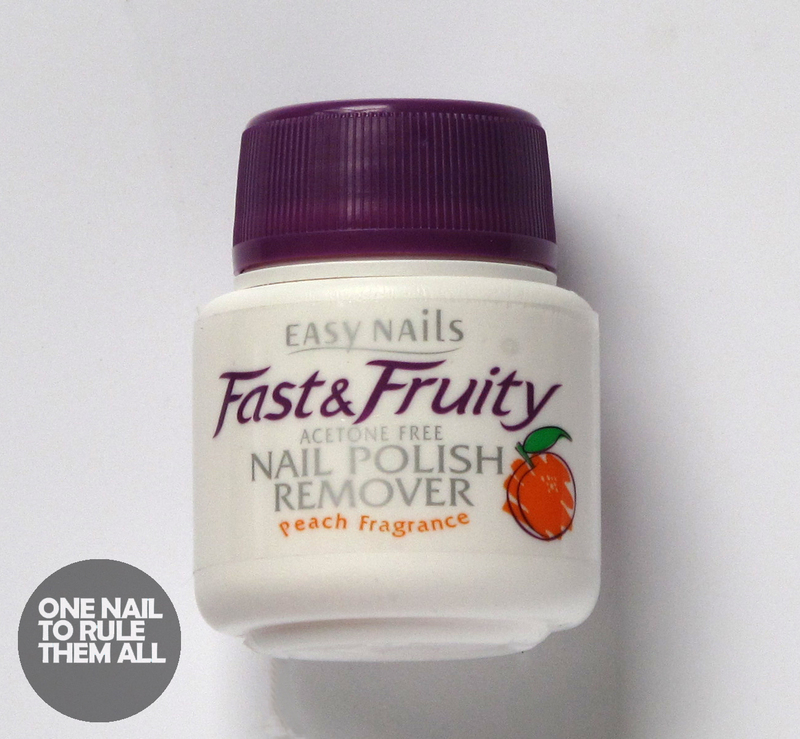 East Nails Fast and Fruity Nail Polish remover is exactly what it says on the bottle: easy! And, it's only 75p which makes it officially the greatest product ever. I've probably gone through over 50 bottles of this stuff. Unfortunately I can't find it online to link to it, but if you're in the UK most Home Bargains shops sell this, and it's definitely worth splashing out the cash on! And last but not least is my new favourite fashion accessory. I've been on the lookout for a new watch for a few weeks after my old one left me with a scar on my stomach and a hole in my foot (a combination of me being the clumsiest person alive and the watch being incredibly sharp). 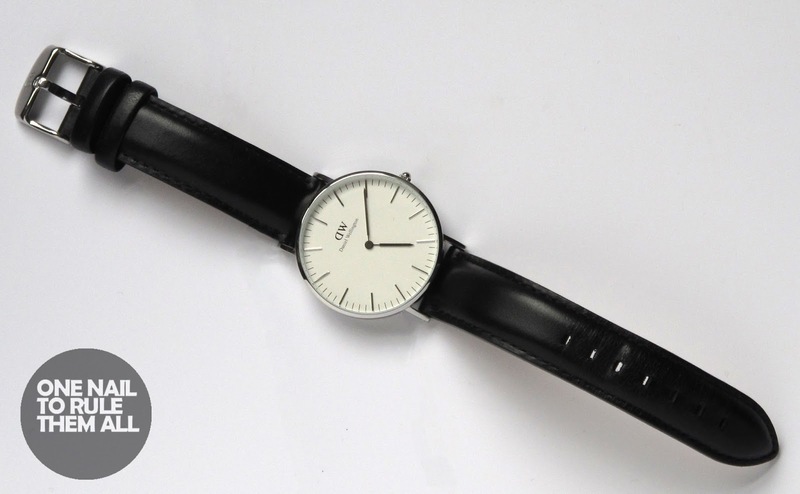 So when Daniel Wellington contacted me and offered me a watch I absolutely jumped at the chance. Their watches are beautiful, and just what I've been looking for. I chose the Classic Sheffield Lady* watch (mainly because I live in Sheffield and it seemed like fate)but there are a number of variations, and you can also buy the straps separately if you want to mix and match. This watch is so comfy, it feels like heaven to my old scratchy watch. You can tell it is genuine leather, but it doesn't weigh it down in the slightest. I promise you that this is a watch worth buying. I chose the silver face but you can also get it in rose gold. I also let my mum model it (below) because she's a lot more tanned than I am (think: Casper the friendly ghost) and so you can see how gorgeous it is! 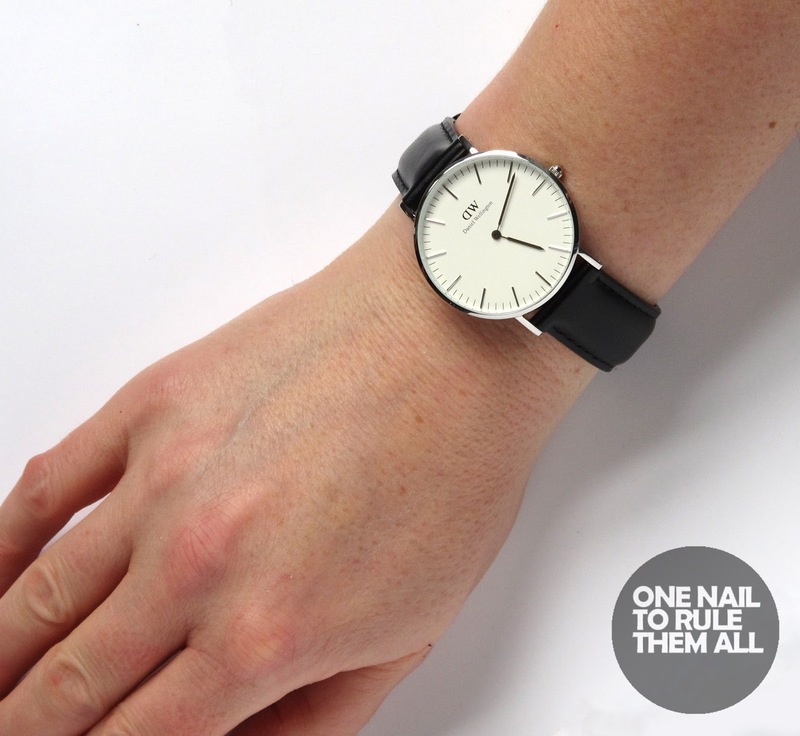 Daniel Wellington have kindly offered me 15% off watches for my readers until the 30th April, you just need to use the code 'onenailtorulethemall'. If you're looking for a new watch, or you just like watches, this is definitely the place to look! What do you think? Do you own any of these/want any of these? 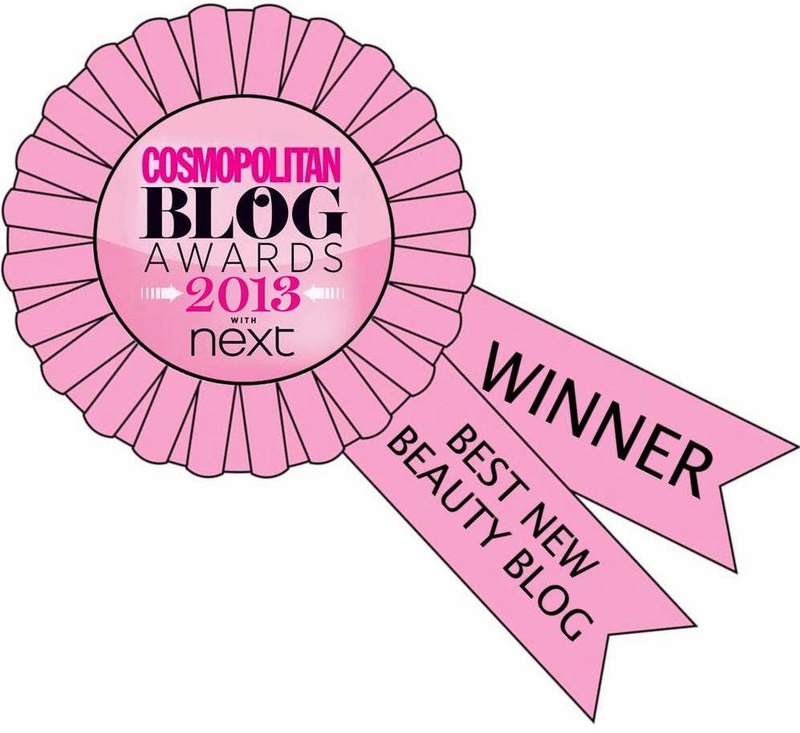 I've been eying up those Barry M speedy dry polishes..... its only a matter of time! I love the Barry M nail polishes, they are a dream! Ha I love that your dad takes these photos for you! I want ALL of those Barry M's they look incredible! What a fun post! I love the watch, and the remover sounds lovely. Those Barry M are plain awesome and that remover sounds just as perfect, too! I love that remover stuff, it's better than ones 3 times the price! So funny that your dad takes the photos, can he come and do mine?! I've been seeing those DW watches everywhere and I love them! The clean look is very attractive. Love the Barry M speed dry nail polishes too!